It is without a doubt at the top of my wish list for the New Year, that I and all my close and distant relatives in the human clan keep perfecting the art of contact. Anything fun to work on in the New Year at the top of your wish list? On the eve of Martin Luther King Day, I love to think about Julia’s poem for the New Year. Her mission and vision make me think of Martin Luther King. And living in that mission is on my wish list for 2014, too. This certainly calls all of us to make a world that is open and friendly for our children, who are on their way. ” Tending to my bruises without doing harm”- this really caught my attention. It reminds me not to dwell or live in the past but rather to acknowledge it and keep moving gently forward while still giving myself the space to heal. This year I will be working on embracing any new blessings- no matter how small. Each step I take on this journey brings me closer to my child. I like what Tracy said about being kind gentle with herself and others- I may borrow that idea- it really connected with something inside me. To be kind and gentle with myself and others. 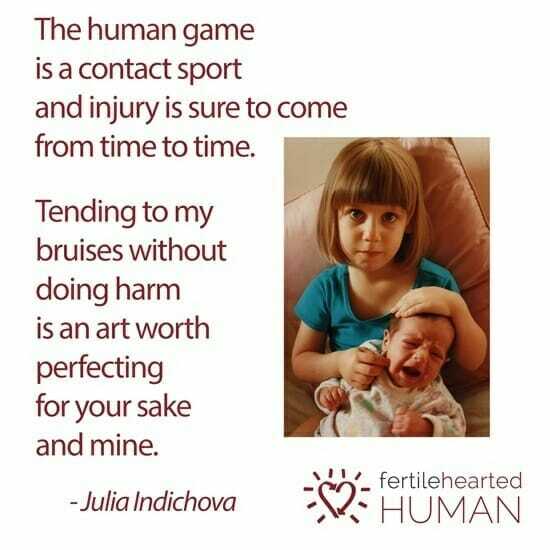 I absolutely agree and will try to improve on the art of contact from my end Julia !! But at the moment, I am in greater need to learn and understand when to defend my fertile heart and when to receive. As even if we try to make an effort to perfect the art of contact and be sensible in our talk/ gesture/attitude, we can never guarantee what or how others might react, which completely imbalances whatever I have put in practice. Pretty interesting lesson that my baby is making me learn. No wonder this journey made be a very sensible and sensitive person and I am truly proud of myself for that, as I mostly come across insensitive folks who intentionally or unintentionally keep hurting others feelings, which they could have easily avoided if they would have applied a little sense…..Main reason I feel is, they never went through any kind of pain or they chose to suffer instead of learning from their experience. 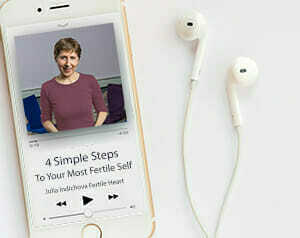 The Fertile Heart tools, the workshops and your books opened a whole new way of thinking and feeling about this journey. They taught me how to gradually become my own Ultimate Mom. I don’t think that our miracle baby, Isabella, would be here today without the work I have done with you and Fertile Heart.